Root canal therapy has truly changed the game for patients suffering from tooth pain and deep tooth infections that in the past may have resulted in a tooth being extracted. With root canals we can save many of these teeth, and help our patients in Fresno who are suffering from tooth pain keep their smiles happier and healthier. Tooth Pain – Having persistent tooth pain that just does not seem to go away often is a sign that a tooth infection has gone too far. Root canals can be used in most cases to help alleviate tooth pain and help your mouth get back to being healthy. Extreme Tooth Sensitivity – Although all on its own tooth sensitivity isn’t necessarily a sign of needing a root canal, if you have extreme tooth sensitivity coupled with other symptoms such as tooth pain it can mean that tooth infection has gone too deep. Abscesses – An abscess (which appears most often as a bump on the gums above the effected tooth) is usually an indication that a tooth infection has gone too deep and too far. 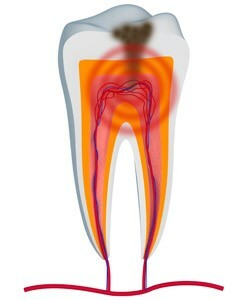 Root canal therapy can be used to treat the infected tooth and help you heal from the abscess the infection has caused and eliminate the tooth pain. During a root canal our team gently removes decayed or infected tissue from the inside of the suffering tooth. Once this part of the process is complete, our team very thoroughly cleans out the infected tooth and seals it to help prevent issues in the future. In most cases the tooth is then protected with a beautiful porcelain tooth crown that can help preserve the tooth for the years to come. You can also say goodbye to tooth pain! We are proud to be able to offer root canal therapy to our patients in Fresno, Clovis, and Madera who are suffering from tooth pain. We are thrilled with every natural tooth we are able to save with this procedure. Have more questions for us about tooth pain or root canals? Get in touch with our team with your questions today!